Little champions need to recharge with family time and alone time between big games. 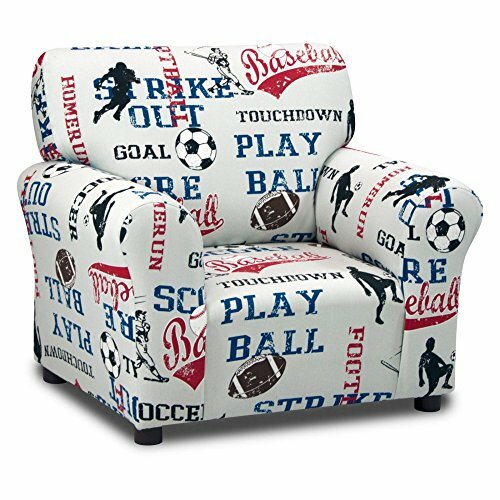 The Kidz World Sports - American Blue Club Chair provides a comfortable spot for your favorite player to relax, read, and hang out. Soccer, baseball, and football feature prominently in the red, blue, and navy print on a light grey background. Fantastic for a boy's room, den, family room, or living room. An internal frame of mixed hardwoods offers durability, while firm, supportive padding cushions all hard edges. Made to fit boys 2 through 8 years. Soft, dense padding for safety and comfort. Sturdy mixed hardwood frame. No assembly required. Recommended ages: 2 to 8 years old. Made in the USA. Seat height: 11 inches. Dimensions: 27W x 21D x 25H in..